Muslim is, of course, about the attack two weeks ago where fourteen people were killed and 22 injured in an Islamic extremism-inspired terrorist attack, consisting of a mass shooting (and attempted bombing). ISIS and “radical Muslims” have taken the news by storm after their attack on Paris, and subsequent attacks. 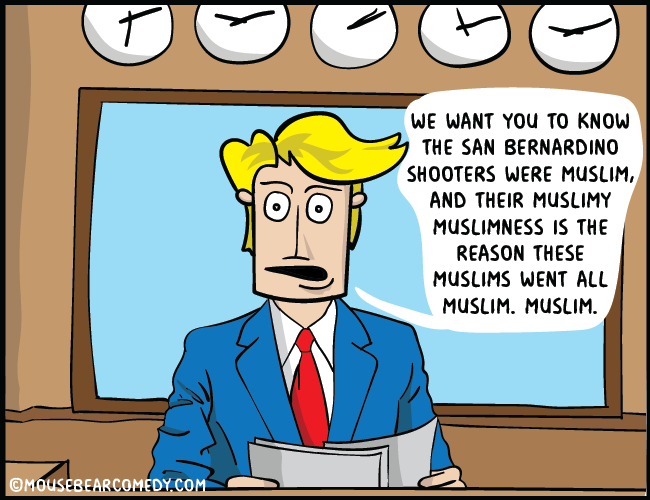 Watching anything about the San Bernardino shootings, it seems the only thing of “importance” that keeps being reported is how the attackers were, “of course”, Muslim. Some of the news outlets have hit this home more than necessary.